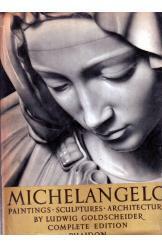 Michelangelo . Paintings, Sculptures, Architecture, by Ludwig Goldscheider. Complete edition, measures 31 by 24 centimeters.